All preferences will be stored in user properties and restored in the next program start. There are a lot of look&feels installed. The default is System wich is fine for Windows, MacOSX and Gnome 2 but for Gnome 3 the System look&feel looks very ugly and you can change it here. 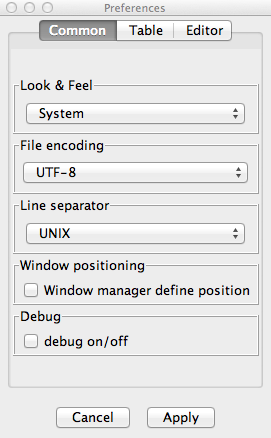 Window manager define position is only useful for special Linux desktops like XFCE with the ability to position the new window by the mouse - before - the window comes visible. The part "Create for references..." are dedicated to the foreign key navigation feature in the result table. The data format will be used in the result table and exports. 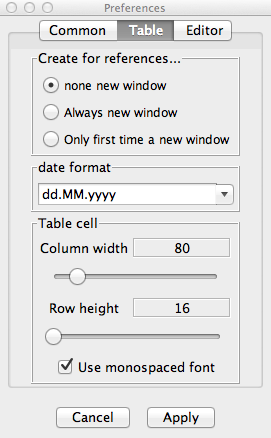 The option Use monospaced fonts is very helpful if you get preformatted text e.g. an explain plan. 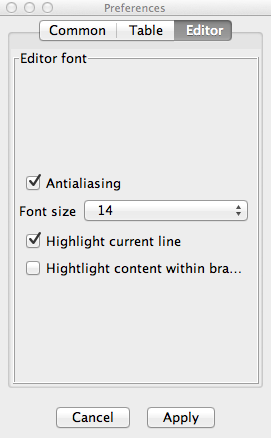 Antialiasing helps to make the text more readable.